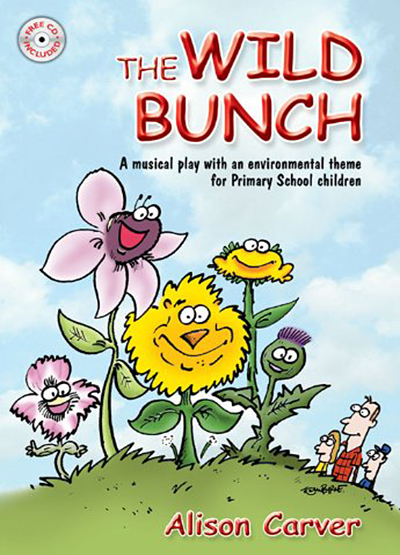 The Wild Bunch is a lively musical with an environmental theme, ideal for Key Stage 2 boys and girls, but also suitable for younger children. Featuring really wild weeds, such as the hip ‘n’ cool toadflax, the rather creepy bindweed and the highland-dancing thistle, it encourages children to consider green issues in an imaginative way. A rather neglected house has a bushy, green hedge at the bottom of the garden. Beyond the garden runs a road but between the hedge and the road can be found a small patch of ground. No one tends this earth and so all kinds of wild plants and flowers have made it their home. The Wild Bunch is aimed at Key Stage 2 but could be performed by a whole Primary School. The original production included the Infant children with the singing and some of the dances. The older children performed the other dances and took the speaking parts. The script was written for a class of children who all wanted a line to speak. However, the dialogue could be split between fewer characters if required, e.g. only two of each of the plants. The dialogue could be split between fewer characters if required, e.g. only two of each of the plants. The only necessary staging requirement is a representation of a hedge as the backdrop. This can simply be a green sheet, or a collage, painted or woven work of art by a group of children. The hedge should preferably be taller than the characters to give a feeling of scale. The props include a wild flower book for the children and optional placards for the plants that state, ‘Save our hedge – Leave it alone!’, ‘Hedges have feelings too!’ etc. The colours of each plant should be reflected in the costumes. Also, the style of each song can give ideas for suitable costumes. Hats are a useful addition as they can be a visual representation of the flower’s head. A few ideas for each character are included in the book e.g. Toadflax – denims/orange neckerchief or scarf /yellow baseball cap.